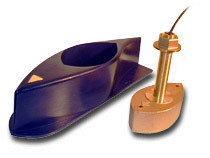 Airmar B260 1kW Bronze Thru-Hull with High Speed Fairing Block operates at 50/200khz. The B260 Style Transducer uses Broadband Technology and Ceramic Element Technology to reach even greater depths and better fish detection with a 19 degree cone at 50khz and 6 degree cone 200khz. For Lowrance HDS and Simrad BSM Models with Blue Connector.